Bizarre is the best word I can use to describe this Bellator pay-per-view event. 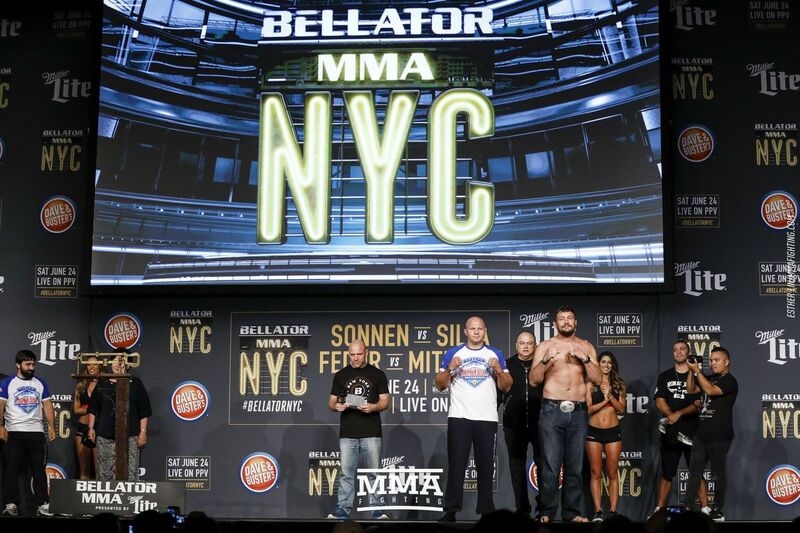 Bellator NYC is finally here and to the surprise of many the fight card remained intact. The headlining bouts for the card likely fit in the unofficial ‘legend’s division,’ as MMA veteran stars Chael Sonnen and Wanderlei Silva will meet in the main event of the card, and Fedor Emelianenko will take on Matt Mitrione in the co-main. Bellator NYC also features two phenomenal championship bouts, as lightweight champ Michael Chandler takes on Brent Primus, and welterweight champ Douglas Lima defends his belt against recent signee Lorenz Larkin. Where: Madison Square Garden, New York City. When: Saturday, June 24. The Bellator 180 preliminary card begins at 6 p.m. ET on MMA Fighting, the Spike TV Bellator 180 main card begins at 8 p.m. ET, and the Bellator NYC pay-per-view event begins at 10 p.m. ET. Many are criticizing this match up, and question the level of MMA fans will be getting in this light heavyweight bout. Although it’s hard to make an argument against those claims, I have to admit I’m happy this fight between Chael Sonnen and Wanderlei Silva is going down. I think it’s sad when a rivalry or beef goes unsettled in combat sports, and we’re left with nothing but speculation on what would’ve happened if the contest would’ve gone down. Well, the Sonnen-Silva rivalry has been brewing for some time, and we’re finally getting conclusion to this feud, even if it’s a few years later. Sonnen and Silva both coached The Ultimate Fighter Brazil season 3 back in 2014. Both fighters were supposed to meet in the season finale, but the fight was moved to UFC 173. The bout was moved again, as the Brazilian suffered a hand injury in a brawl with Sonnen during the filming show, causing the fight to move to UFC 175. In the buildup to UFC 175, Silva did not attend a hearing to get licensed for his fight with Sonnen and had some issues with the NSAC, which caused him to be dropped from the card. Vitor Belfort replaced Silva, but just days later Sonnen failed a random drug test and was also pulled from the card. Since that whole mess, Sonnen retired from MMA – but remained competing in grappling matches – and then un-retired to sign with Bellator last September. The man with the biggest biceps made his Bellator debut earlier this year against Tito Ortiz where he suffered a first-round submission loss in a very lackluster performance. Meanwhile, Silva hasn’t competed since 2013, as he was given a lifetime ban by the NSAC. The ban was later reduced to a 3-year suspension, which allowed him to compete after May 2017. This is a tough fight to breakdown since there are many unknowns. Silva hasn’t competed in four years and Sonnen has had very little cage time. Either way, here are the factors I think will determine the bout. The takedown: Many think Silva is washed up, and with good reason. The man hasn’t fought in four years, he’s 40 years old, and he has a lot of milage on him. But let’s not forget, his last performance was one of the best in his career, as he demolished the very game Stann in a Fight of the Night performance. Sure, we should expect a slower and older Silva here, but regardless, he should have a big striking advantage over Sonnen. This makes wrestling very important for Sonnen’s path to victory. In his prime, Sonnen was one of the best MMA wrestlers in the game, but I’m not sure that’s still the case today. Sonnen will have to come in with solid set-ups and takedowns in order to leave with a victory because I don’t see him winning on the feet. Grit and want: Being in fight shape and being technically sound is extremely important to win any fight, but so is having heart and want. Sometimes we overanalyze MMA and think everything comes down to technique, but the truth is that this is a fist fight, and fist fights are tough. I’m not sure how much fight is still in Silva, but I believe there’s still some of that notorious violence left in him. On the other hand, Sonnen has failed to show his his unbreakable heart and grit in his most recent performances. I find this to be key because I believe Sonnen’s lack of grit and tenacity is what has cost him his most recent losses. Another tricky one here, but at least we have a reliable factor in Matt Mitrione. Fedor Emelianenko was on top of the world six years ago, but today some question whether “The Last Emperor” should be even be fighting. Yes, he’s won his past five bouts, but it hasn’t been against great competition, and he hasn’t looked too sharp either (especially in his last fight against Fabio Maldonado). Regardless, Emelianenko still has a ton of experience, toughness, and powerful strikes that can end fights. Meanwhile, Mitrione still looks to be in his prime. The former UFC fighter has great boxing, good power, and very, very light and quick movement for a heavyweight. Mitrione has fallen before to heavy-punchers, which makes this bout interesting. I think Emelianenko has a good chance in winning here, but not good enough to make him my pick. Emelianenko keeps his hands low, and Mitrione is very active with his hands. I see “Meathead” out-striking Emelianenko to earn a decision or possibly a stoppage. This will likely be the most technical fight of the card, and probably be the most exciting one too. The champion Douglas Lima is 10-2 since joining Bellator in 2011. Lima is a scary striker with vicious leg kicks and stupid power behind his punches. Lima also has good takedowns and a very slick ground game with dangerous submissions. His opponent, Lorenz Larkin is somewhat similar. The recent Bellator signee has great power behind his strikes and some mean leg kicks. Larkin doesn’t have the same grappling credentials as Lima, but he does have a great takedown defense that usually cancels out the ground advantage from his opponents. Besides the ground edge for Lima, there are a few other major differences between the two fighters. I’d say Lima is the more powerful striker and possesses the better chin, but Larkin is the faster striker and has a higher output and higher pace to striking. This fight is very tough to call. Part of me wonders how much success can Lima have with his takedowns and grappling. If Lima has a difficult time getting Larkin to the ground – which I suspect – I can see Larkin edging out Lima on the feet based on the amount of strikes landed. Yet, another part of me also sees Lima doing more damage on the feet than Larkin, making him look more dominant in front of the judges. If this were a three-round fight, I think I’d lean towards Lima, but it’s not, so I’m going to hesitantly pick Larkin. I find this to be the easiest fight to pick from this card. Brent Primus is good, and that’s why he’s undefeated in his MMA career and challenging for the lightweight belt. He’s strong, tough, and possesses a solid ground game and decent striking arsenal. However, Michael Chandler is just at a different level. Chandler has superb wrestling, and his striking has dramatically improved, turning him into a huge threat on the feet. Although, Primus is the bigger guy, Chandler has a significant edge in speed department and that should play out in the fight especially considering Primus’ lack of head movement. I think this should be a highlight-reel performance for Chandler, and I see the champion besting Primus anywhere the fight goes. Look, Bellator would never put one of their brightest prospects in a fight that’s not favorable. Many are second guessing themselves here because Aaron Pico is making his MMA debut against someone that already has 10 professional fights. Zach Freeman is not a bad fighter, but I don’t think he’s great either. The 33-year-old has a solid ground game with good submissions, and he’s also physically strong, which enhances his grappling. But on the feet, Freeman is a bit slow and doesn’t have the best head movement or footwork. Pico is a national junior Golden Gloves champion, so he should have a big advantage on the feet. And Freeman’s strong point on the ground, shouldn’t be much of an advantage considering Pico’s phenomenal wrestling. I see Pico having an advantage anywhere the fight goes. Despite being known for his elite wrestling credentials, I think Pico will score a knockout on the feet.